Among the paintings of Arkhip Ivanovich Kuindzhi “Autumn” is not the most famous canvas. However, it attracts to its quiet charm. A forest landscape with trees and a barely visible path seems a bit gloomy, which conveys the feeling of an inexorable reduction in daylight. Nature is preparing for the winter. Only one tree – it is in the very center of the composition – stubbornly continues to turn green. Perhaps because it is lonely and receives a little more light than the rest. Around – a riot of colors of autumn. In the background are golden trees. Most likely, this birch. To the left of “stubborn” of the tree, too far away, a red maple. Part of the foliage is colored in brown tones, and the sky is grayish, as if pierced with threads of a beginning fine rain. Only the crimson on the right side of the canvas, and the red bushes that clustered along the path, remind us that the sleepy rays of sunset are still shining through the clouds. 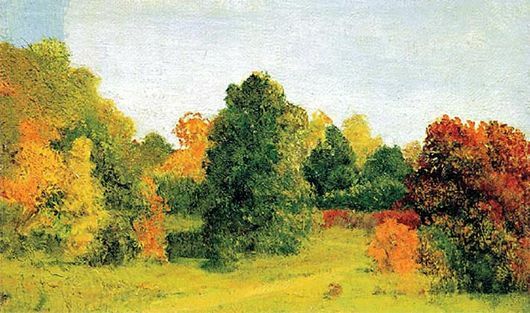 Judging by the rich foliage of the trees, the artist found early autumn. The trees seemed to freeze in anticipation of the cold, but this landscape is still permeated with the remnants of summer heat, carefully preserved autumn forest.